Brand New 6BR/6BA Beach Home - Pool, Elevator & Playroom - Close Beach Access! Gulf Coast Getaways is happy to introduce a brand new showcase home! This is a beautifully constructed, 6BR/6BA beach home designed for the large family beach vacation getaway. This is in a most desirable spot on Pensacola Beach - on the eastern end away from congestion and in a residential low density setting. The house is on the corner of Via De Luna and Calle Traviesa - and it is about 100 steps to the beach walk over access point, just an easy walk down the paved sidewalk with no major road to cross. The house boast 5 main bedrooms with a downstairs loft which acts as a 6BR. The main floor is huge and spacious - open floor plan with commercial grade chef's kitchen, with large island and dining room table that sits 12. The appliances are top of the line, commercial level fridge, separate ice maker (a must have at the beach! ), five place electric stove top, large double oven, microwave, Keurig and regular coffee maker, and of course fully stocked kitchen cookware and place settings. The master suite is on the main floor, with King Bed and full master bathroom suite. In the hallway to the master bedroom is a hidden bunk room with two twin beds and tv - perfect getaway sleeping for kids! The living room has a nice large sectional couch with queen sleeper sofa, those guests who use the bunk bed and queen sleeper sofa have their own full bathroom in the hallway! The upstairs is set up perfectly - there are four bedrooms. The first bedroom is the bunk room with double queen bunk beds and own private full bathroom. The second and third bedrooms both have king beds and share an attached full bathroom. Lastly there is a second type master suite with King bed and full bathroom. The upstairs sleeps 14 in beds with 3 full bathrooms. The house really expands and stands out when going to the ground level garage area! This has been set up as play room with the following great amenities - basketball game, corn hole set up, ring toss game, dart board, and a 70 inch flat screen wall mounted TV. Additionally, there is a loft type bedroom set up for the adventurous kid/teenager and sleeps 2 with two twin beds lying flat together. There is a bathroom that services the loft bedroom and there is an outdoor shower which can be used as well. The garage area is fully utilized as a hang out area and kids will love it! The house is full of great deck space - it has a 3 deck system with wrap around decks on the front of the house expanding around to the east side of the house. 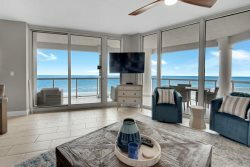 The upstairs has its own private deck with the bonus sky deck that takes you to the rooftop and gives some of the best views on Pensacola Beach! Lastly, the new pool being installed in April 2017 will be a relaxing getaway with deck space and a great option when not at the beach. The time to reserve and book this house is now! Be one of the first to enjoy this incredible new beach home. Each member was patient, professional, and efficient. They were cheerful in their texts and on the telephone. Very impressed with this company and will use them rather than going through VRBO. Thank you so much for making our homecoming so pleasant and relaxing. We truly enjoyed our time. And with so much space, we could relax and enjoy spending time with all the in-laws and out-laws under one roof.